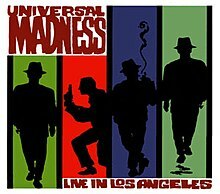 Universal Madness is the second live album by ska/pop band Madness, released on 2 March 1999 (see 1999 in music). It was recorded at the Universal Amphitheater on 26 April 1998 in Los Angeles. The show was Madness' first in America since 1984.